For detailed information on salt flats in southern California, see Appendix 7 of the Regional Strategy 2018. Salt flats—also known as salt pans (or pannes), salinas, alkali flats, playas, and sabkhas—are unvegetated seasonal wetlands characteristic of arid, semi-arid, and Mediterranean climate coastal environments such as Southern California. 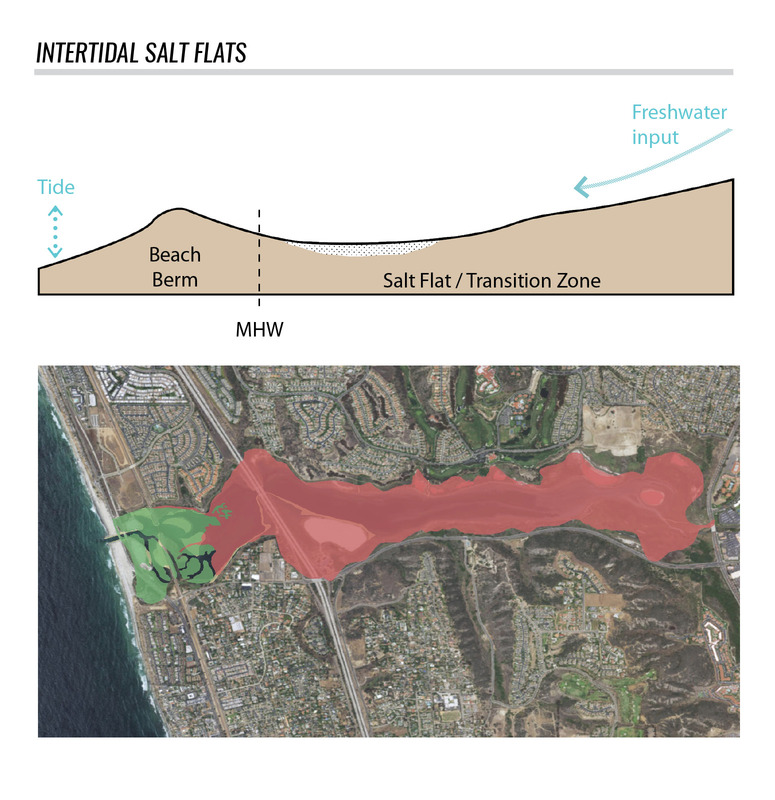 They form in areas disconnected from regular tidal inundation and where water ponds—perhaps above normal tides (supratidal) or behind an ocean barrier such as sand dunes or a closed estuary mouth (intertidal) (see diagram below). High salt concentration in the soils, a result of high evaporation rates, keeps them unvegetated. They experience large fluctuations in salinity and inundation—parts of the year they are dry flats and other times they are shallow ponded areas. As a consequence their ecosystem functions and services vary during the year and between years. When flooded, salt flats can support foraging for resident and migratory birds: dabbling ducks and shorebirds can feed on invertebrates, invertebrate larvae, and the occasional small fish, while diving birds such as grebes, cormorants, and ruddy ducks can feed in deeper water. Drying salt flats can provide breeding habitat for the state and federally endangered California least tern and federally threatened western snowy plover, in addition to resident birds such as black-necked stilts and American avocets. When dry, salt flats can support roosting and refuge for birds able to congregate safely in the large open space, as well as corridors for traveling mammals and habitat for invertebrates such as tiger and rove beetles and microcrustacean and aquatic insects such as water boatman and brine flies. Salt flats were historically present in approximately one-quarter of Southern California estuarine systems. 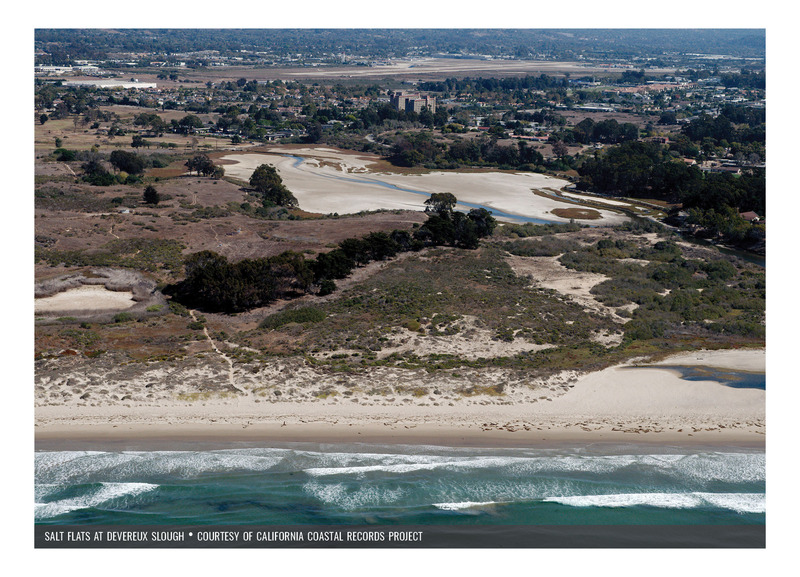 They were found across the Bight, from Goleta Slough to the Tijuana River Estuary, and covered more than 3,000 acres (1,210 ha) or about 10% of the total estuarine area. The largest salt flats (between 150 and 1,000 acres [60–400 ha]) were found in Batiquitos, San Elijo, Buena Vista, and Agua Hedionda lagoons, at Goleta, and Mugu Lagoon. Salt flats have experienced dramatic changes since the 19th century, with losses of approximately 80% of total area. However, there are still a few salt flats in the California Bight region, for example in Devereux Slough, San Elijo Lagoon, and Tijuana River estuaries. 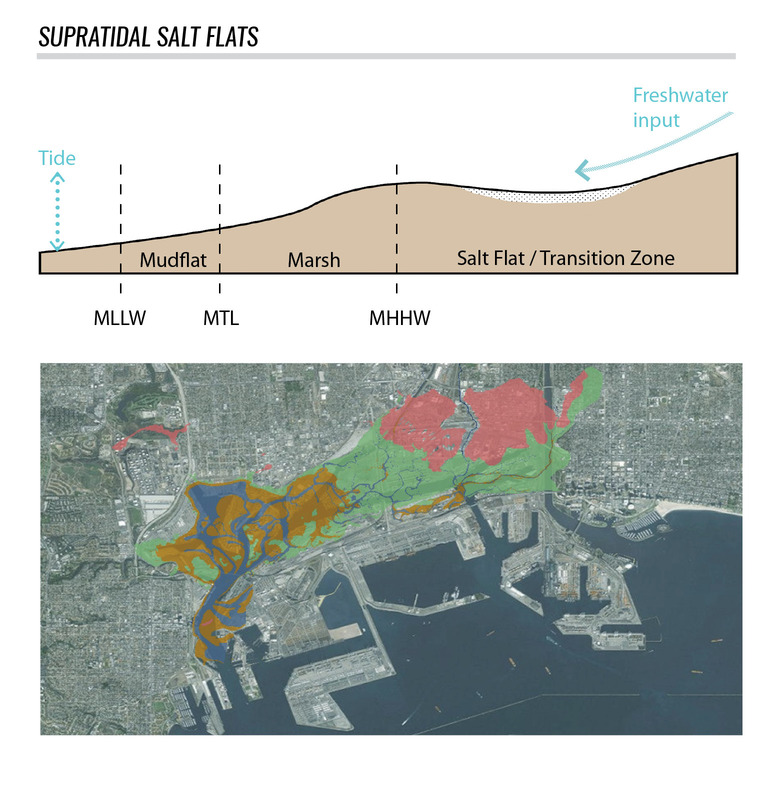 The figures below show the historical extent of salt flats (pink shaded region) in Los Angeles (left) and San Diego (right). The lack of knowledge of the formative processes, historical and contemporary distribution, and ecosystem functions and services of salt flats in the region means we are currently unable to identify appropriate regional Objectives for salt flat management. They are an important component of overall estuarine and transition zone habitat diversity in Southern California and appear to be under-represented in current systems.